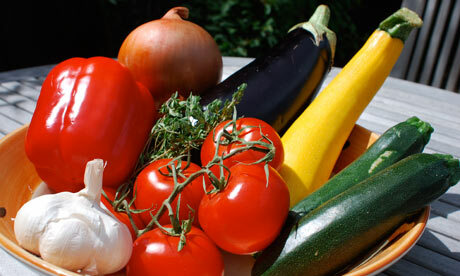 Vegetables are heaven sent when you are trying to eat healthy, lose some weight or fill a hungry tummy. Nutrient rich, satisfying and low in calories, they are your “partners” to help you succeed. I’ve never understood people who choose to drink vegetable juices instead of actually EATING them – the latter much more satisfying, you get that crunch and difference in texture and the benefits of the fiber. Naturally, you wouldn’t eat 2 lbs of vegetables right before you step on stage or do a photo shoot, because all that fiber will bloat you – but who cares about that on a regular day? It goes away eventually, and your stomach will gradually get used to eating more of these beneficial foods. My favorite way of preparing vegetables is to roast them. This is also a perfect method this time of year, during the cold winter months. Roasted root vegetables with a nice piece of chicken or game, some roasted potatoes and I’m good to go. 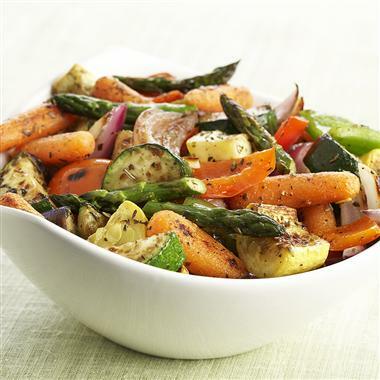 In the summer, I roast a whole plethora of vegetables such as zucchini, tomatoes, bell peppers, eggplant and onions or to top on my salad for a rataouille (soup), or even throw it on top of a low carb pizza for my cheat meal. I also roast vegetables to make my own vegetable or chicken stock, as the roasting process produces so much more flavor in the vegetable then boiling or steaming it. The sweet flavors of the veggies come out, even some earthy notes, throw in some fresh herbs like thyme, rosemary and oregano and a couple of smashed garlic cloves, and you’ve got yourself a gourmet meal right there! Preheat oven to 350F. Spray a roasting pan or half sheet pan with Pam Spray. Cut the squash in half and scoop out the seeds. Cut the flesh into 1/2 inch dice. Alternatively, you can roast the halves whole. Spray the squash with a bit of Pam Spray and combine with the maple syrup in a bowl. Arrange in a single layer in the pan. Roast for about 30 minutes or until tender. Meanwhile, combine cranberries and wine and heat for 30 seconds in microwave or in a small saucepan over low heat until soft. 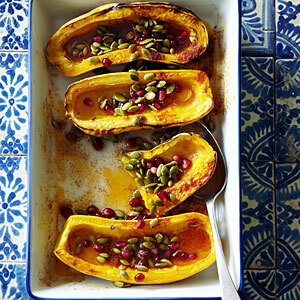 When squash is tender, transfer it to a serving bowl. Add the softened pomegranate seeds, pepitas and ginger. Toss to mix. Serve hot. A great workout to do at home plus a reward! Your recipes are great Sunny!